Fission yeast are unicellular, rod-shaped fungi that divide by medial fission. Studies using fission yeast were instrumental in identifying fundamental mechanisms that govern cell division, differentiation, and epigenetics, to name but a few. Their rapid growth rate, genetic malleability, and similarities to more complex eukaryotes continue to make them excellent subjects for many biochemical, molecular, and cell biological studies. This laboratory manual provides an authoritative collection of core experimental procedures that underpin modern fission yeast research. The contributors describe basic methods for culturing and genetically manipulating fission yeast, synchronization strategies for probing the cell cycle, technologies for assessing proteins, metabolites, and cell wall constituents, imaging methods to visualize subcellular structures and dynamics, and protocols for investigating chromatin and nucleic acid metabolism. Modifications to techniques commonly used in related species (e.g., budding yeast) are noted, as are useful resources for fission yeast researchers, including various databases and repositories. The well-studied fission yeast Schizosaccharomyces pombe is the focus throughout, but the emerging model S. japonicusa larger, dimorphic species with several desirable characteristicsis also covered. 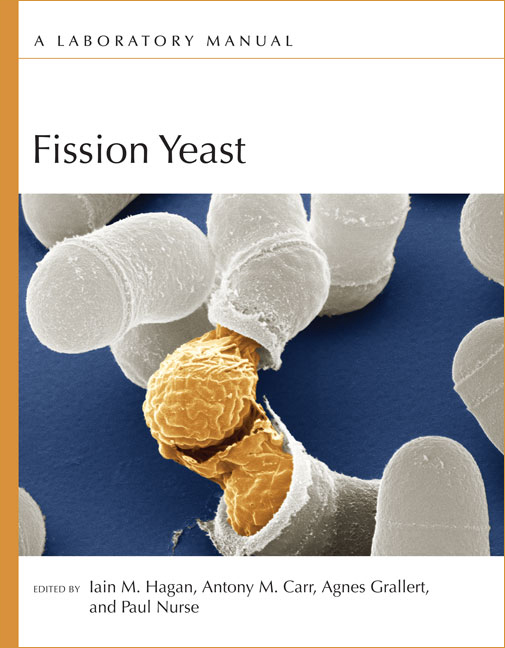 This manual is an important reference for existing fission yeast laboratories and will serve as an essential start-up guide for those working with fission yeast for the first time. J. Richard McIntosh, Mary K. Morphew, and Thomas H. Giddings, Jr.